Wayne Mansfield: Where do the students park at this high school? OK I will drive myself but where do I park? I am sitting in Queen Street Melbourne - you forget how cold Melbourne is until you visit again! - having a coffee - about 3000 kilometres from my last coffee in Perth. I am going to do 6 hours of sessions than fly back to Perth and away from the cold. Why is coffee so cheap in Melbourne - it could be that it is terrible but that maybe just this place but what costs $4.40 in Perth costs only $3.20 here - strange stuff!! Unexpected consequences?? In today's photo I have a story from the Perth Sunday Times that talks about parking issues at Perth's secondary school... when they increased the age that ypung people had to continue education, there was no allowance that more students would be of Drivers Licence Age and they would choose to drive to school. 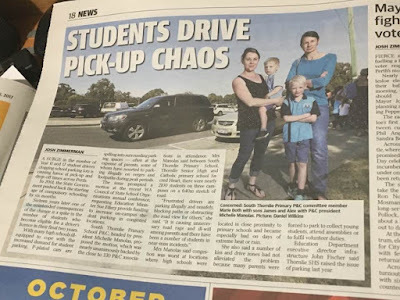 The result - chaos at the start and finish of the school day as students collide with parents dropping off and picking up younger students and a general lack of parking... the people who increased the school leaving age, didn't plan for more students driving to school. There are dozens of examples of "unexpected consequences" like this and I will find a few and share them with you as they make themselves known.